This is a great add-on to arduino or raspberry pi, It comes with more than 500pcs sensors and components, all components are carefully bagged, most of them bagged separately, with combined bags pretty logical.The box is large enough, you can easily to repack all the stuff back into the box . We provide more number of resistor(220 ohm 40pcs and other value 20pcs,but other sellers only 10pcs each value), so that you are enough to use, don't need to spend extra money to buy. The breadboard comes with a power supply, you can set one side for 5VDC, and the other for 3.3VDC. It has a push switch to turn the power on or off.In addition, we also provide a male to male USB Power Cables, this is hard to find,but other sellers do not provide. CHOKING HAZARD-- Small parts. Not for children under 3 yrs. 【GREAT ADD-ON TO ARDUINO OR RASPBERRY PI】 -It's a starter kit that perfect for anybody who wants to start using Arduino or Raspberry Pi. 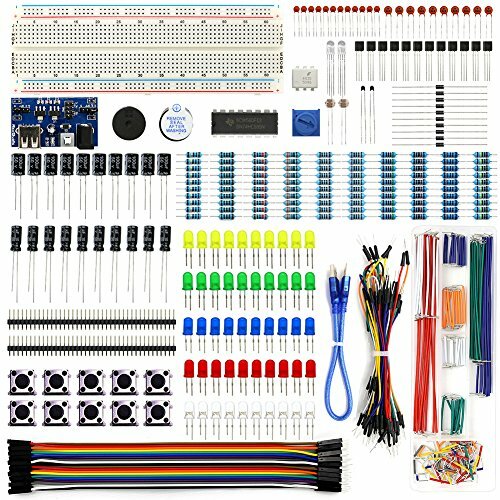 【HIGHEST COST COMPONENTS KIT】 -It comes with more than 500pcs sensors and components for fun and simple electronic projects. 【GREAT QUALITY AND BIG BOX PACKING】 -Resistors/LED/Transistors and Integrated Circuits are individually packaged and labeled, and packing in a plastic box which is bigger enough for you. The Breadboard Power Supply come with a USB Power Cables,which is hard to find. Datasheet and Tutorial are available to download from our official website or you can contact our customer service.